It’s always great when parents can source free craft gear for kids’ art projects, so why not venture into the backyard or local park for a few rustic supplies? Pressed leaves or wildflowers are a fun throwback craft, twigs work perfectly for homespun dolls, but pine cones provide the base for a whole host of creative endeavors. So, gather a few pine cones in all shapes and sizes, give them a quick rinse, and set them out to start working on any of the dozen kid-friendly ideas below. Cut a few simple animal parts from brown, white, and black felt, then layer and glue together for a fox’s face, paws, and tail. A small length of wire tucked between two matching tail pieces helps capture the fluffiness and fullness of the real deal. Hot glue works best for quick adhesion with this craft, so adults should monitor kids closely when a high temperature glue gun is in use. Turn a cold-weather artifact into a tropical souvenir with this straightforward tutorial. Kids will love coating a pine cone in yellow paint (add glitter or metallic paint for a touch of sparkle), then simply cut and paste paper leaves around the stem of the cone. These looks super cute, and bring the brightness of summer inside, clustered together in a fruit bowl on the counter. A few sheets of sturdy card stock, cut into circles, are almost all you need for this adorable pine cone project. Shape the brown paper circle into a cone, doodle on a few facial features, then glue to the tip of the pine cone. Pop these friendly little critters onto their homemade grassy knolls, then add to your coffee table centerpiece. For a more precise kid-crafter, this painterly tutorial puts a beautiful spin on the ombre trend. Using a stiff paint brush and a steady hand, paint the tips of each scale, starting from the bottom of the cone. Transition every two or three rows to a lighter shade of your chosen color, and cycle through at least 3 shades. Try a few of these in different tones for an easy, colorful indoor/outdoor decoration. A large, slim pine cone is ideal for the body of a royal penguin. Paint the cone black (place the entire thing in a disposable cup for easy cleanup and total coverage), then add a felt beak and tummy. Finish off the royal penguin with pom pom eyes, pipe cleaner feet, and a floof of yellow feathers right on top. 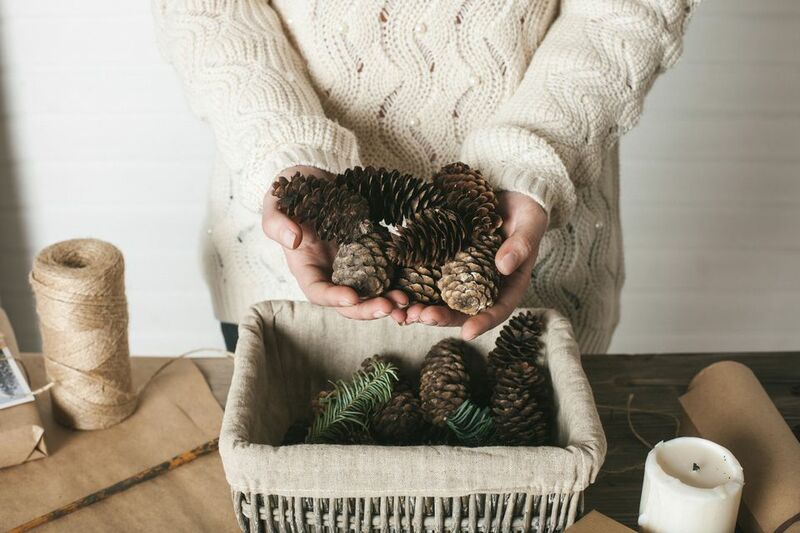 Try freshening up your seasonal centerpiece with a bouquet of painted pine cones. Flip a cone upside down and paint in vibrant colors, adding a yellow circle center. Glue onto wooden dowels and pop a bunch into a rustic vase for a charming bouquet, or just set your colorful cones into paper cups and group together. Pro Tip: Cut a pine cone in half exposing a new surface and a different type of flower. This craft makes great use out of your felt scraps. Cut a few simple shapes, and layer together for an owl’s curious eyes and flapping wings. Select a short, stocky pine cone for the cutest little owl statuette, and add a pair of wide googly eyes to finish the piece. Hide these adorable critters in a potted plant or tucked away in the garden for a sweet little secret. 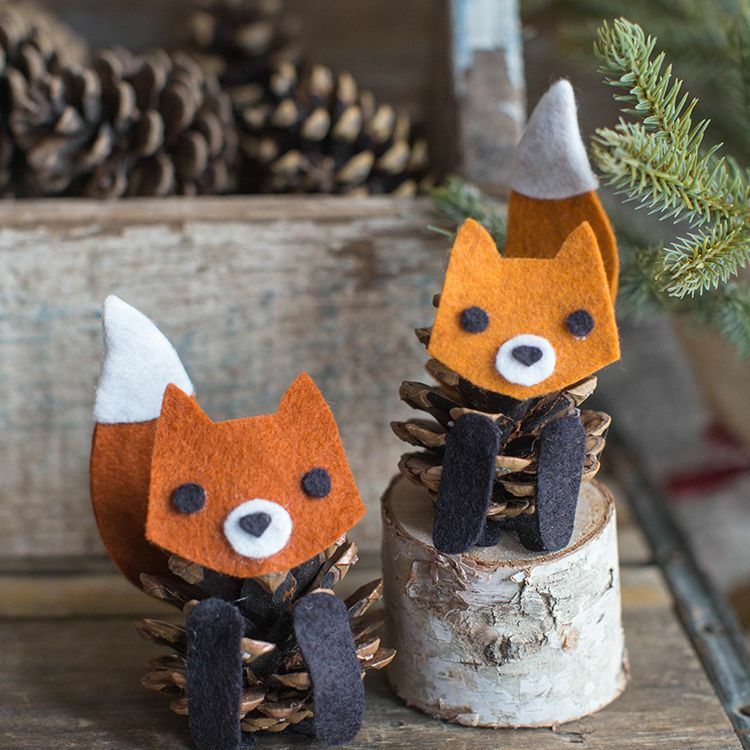 Grab a couple of clean pine cones, and add some easy felt pieces for mittens and feet. While this tutorial uses a needle and thread for the gnomes’ pointy hats, those could easily be glued together as well. Use a skinny marker to draw simple facial features onto wooden beads to complete these sleepy gnomes. Add a pop of rainbow color to a couple of pine cones using pom poms and tacky glue. Kids can work on patterns and color identification with this happy, simple craft. These are excellent as ornaments, strung together in a garland for a kids’ party, or as everyday decor. This project allows your kids the joy of a potted plant, without any of the work of keeping greenery alive. Decorate small terra cotta planters (use paint, glitter, markers, or any other kid-friendly craft supply), then glue a pine cone directly onto the planter. Add your own spin by decorating the pine cone as well, think: glitter, pom poms, or rhinestones. These look especially cute grouped together on the kitchen table. Choose colorful, coordinating yarn, and wrap lengths around a few pine cones. Children can work on motor skills by weaving the string in and out through the scales. This one comes together easily - no glue required; the pine cone will keep the string tightly in place. Great for a group of kid crafters, this activity requires a bunch of pine cones and plenty of paint. Color each cone, then string them together using twine to form a snake. Finish with googly eyes and a darting red tongue. Challenge kids to see how long their snake can get!